An official of the Vietnam Football Federation (VFF) has won a seat on the Asian Football Confederation (AFC) Executive Committee for the third consecutive time, at a time when Vietnamese football exhibits a bright performance at both Southeast Asian and continental competitions. 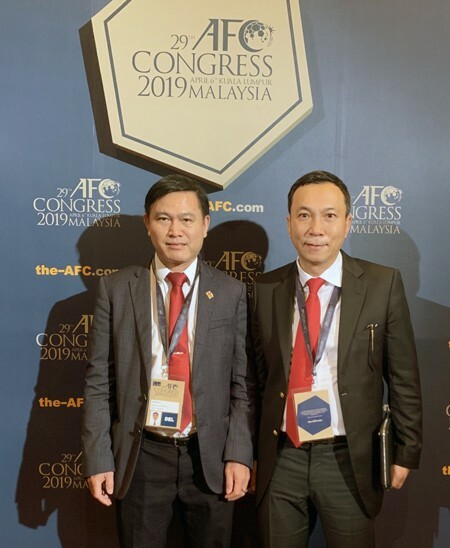 Tran Quoc Tuan, VFF vice-president, was re-elected to the AFC Executive Committee at the 29th AFC Congress, which concluded in Kuala Lumpur, Malaysia on Saturday. He will serve a four-year term lasting from 2019 to 2023. This is the third time in a row that Tuan has been named an AFC Executive Committee member. In the 2011-15 term, he earned very high confidence from the AFC Congress and became the first Vietnamese to ever join the AFC Executive Committee. He won the same seat for the second time at the 28th AFC Congress, organized in Kuala Lumpur in October 2018, to serve the remaining time of the 2015-19 term. Tuan vowed to try his best to help Asian football grow after his re-election. FIFA President Gianni Infantino attended the 29th AFC Congress and lauded its success in his speech. He also congratulated VFF and Vietnamese football on their strong performance at Southeast Asian and continental levels over the past year. Vietnam were runners-up at the 2018 AFC U-23 Championship, made it to the fourth place in men’s football at the 2018 Asian Games, won the 2018 ASEAN trophy, and ranked among the top eight teams at the 2019 Asian Cup. The Golden Dragons now eye the long-awaited gold medal in men’s football at the 30th Southeast Asian Games in the Philippines at the end of this year. The AFC Executive Committee is responsible for implementing AFC statutes and decisions of the AFC Congress, according to the AFC website. “All decisions made by AFC standing committees must also be ratified by the Executive Committee,” the site says.